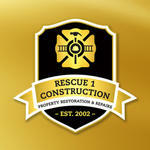 Rescue 1 Construction has been in operation for over 10 years and proudly serves the Kansas City region. Created by a man with a vision for quality property restoration, home remodeling, handyman, roofing, bathroom and painting services. Establishing himself by exceeding expectations of his clients project by project. "My experience with Rescue 1 Construction has been very positive. I have now worked with them several times, and they have been awesome in coming in to get the work done. They fit me into their schedule in spite of being very busy because I was in such a desperate position with my house remodel. I have other projects in the future, and will definitely call on them again. Thank you so much for all the great work Rescue1!" "We had a major remodel done by Rescue 1. We had the wall removed between the kitchen and living room. They replaced the ceiling, walls, flooring, cabinets, plumbing, and electrical. If you are looking for quality work, I would recommend them to anyone planning a major remodel project. They will not cut corners nor use sub-standard materials. They made my dream kitchen a reality." My experience with Rescue 1 Construction has been very positive. I have now worked with them several times, and they have been awesome in coming in to get the work done. They fit me into their schedule in spite of being very busy because I was in such a desperate position with my house remodel. I have other projects in the future, and will definitely call on them again. Thank you so much for all the great work Rescue1! We had a major remodel done by Rescue 1. We had the wall removed between the kitchen and living room. They replaced the ceiling, walls, flooring, cabinets, plumbing, and electrical. If you are looking for quality work, I would recommend them to anyone planning a major remodel project. They will not cut corners nor use sub-standard materials. They made my dream kitchen a reality. Review Stream Powered by OMG National | © Copyright 2019. Rescue 1 Construction. All Rights Reserved.